Here are my picks from around the web. This masterpiece was brought to my attention by The Creative Museum. Merci, Monsieur Touzinaud. The most magnificent cameos are those where the artist gives the natural coloration in the stone a purpose in his carved figure. In these stunning examples, the color defines flowers in the women’s hair. 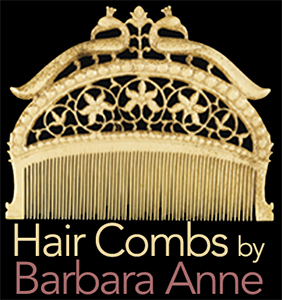 After the French Revolution of 1789, Napoleon Bonaparte, then First Consul, wore combs with three medallions, which held up his shoulder-length hair in a bun. 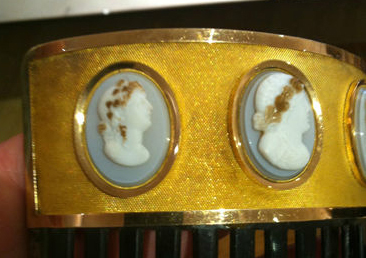 Medallions on the best combs were porcelain cameos. 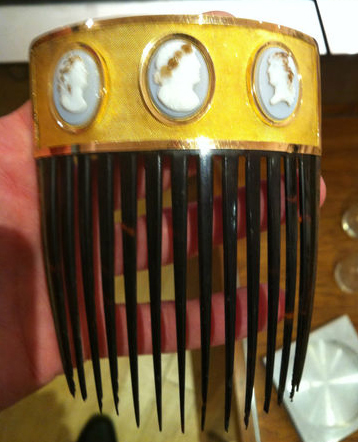 On E-Bay, just such an 18th Century comb from is selling for 3500 Euros. Gold outlines vermeil as well as the three sublime cameos. The decoration sits on tortoiseshell. 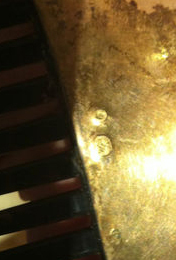 I have asked the seller for a closeup of the maker’s marks to see if I can find out who the jeweler was. 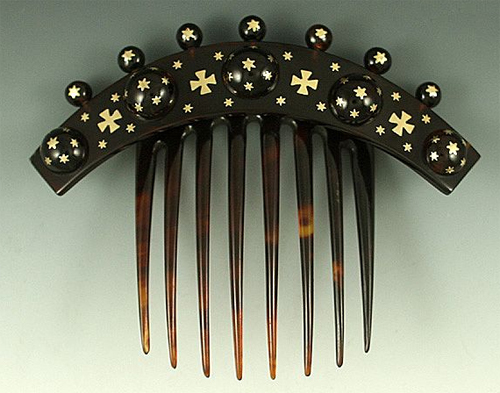 On Ruby Lane, a beautiful Victorian tortoiseshell comb is selling for $395. 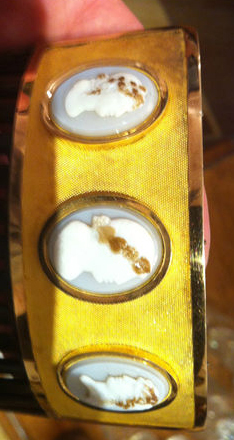 The pique work is done by hand in 14K gold, it has a Peigne Josephine influence, beautiful condition, c. 1850. I love it. 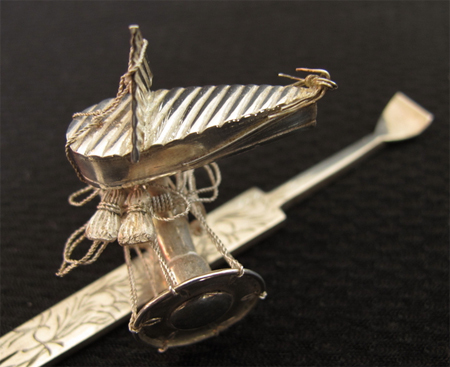 These silver kanzashi in perfect condition depict traditional Japanese instruments and are selling on E-Bay for $680. The biwa rests on top of a drum. They are listed as being c. 1930. 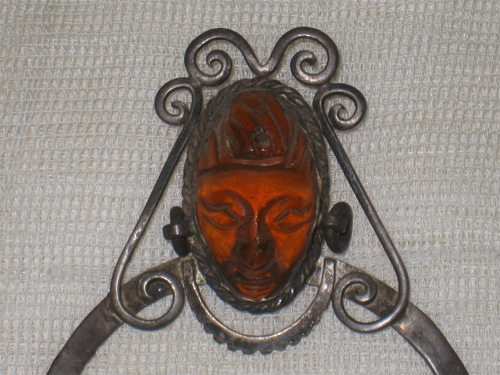 I love this antique Mexican silver comb with an amber carving of Maya woman. 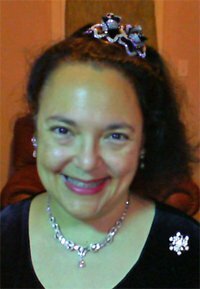 She is wearing a traditional headdress with earrings that move. 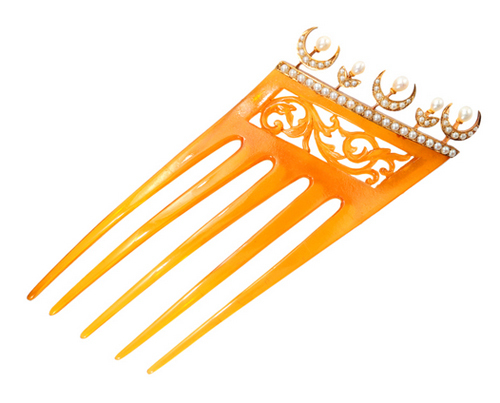 The comb was made to hold a mantilla veil. I love the open design paired with the intricacy and accuracy of the carving. 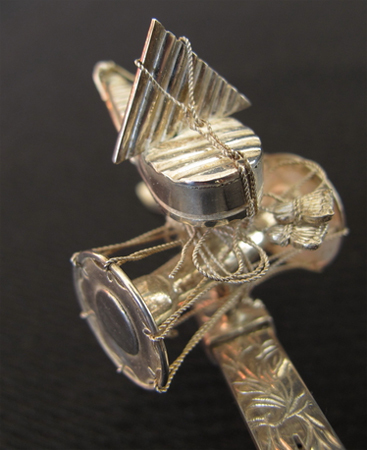 It symbolizes imagination and a respect for Indian ancestors in a Spanish world, and is selling for $254 on E-Bay. 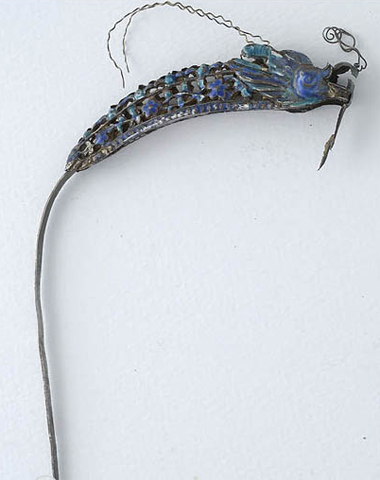 This enamel-on-silver Chinese hair pin, c. 1900, is selling for $165 on E-Bay. 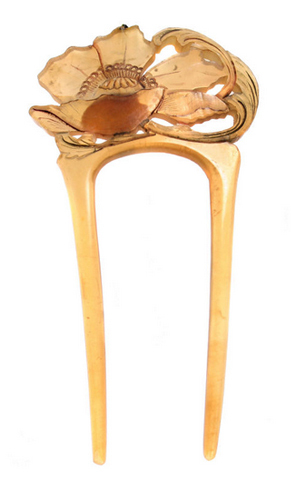 From the site 1stdibs, this French Art Nouveau comb c.1905 was first sold at the Galleries LaFayette in Paris and ended up with a dealer in Chicago. The maker is unknown, and it is selling for $650. Finally, a beautiful blonde tortoiseshell English Victorian comb supports tulip buds in crescent moons on top of a row of seed pearls. 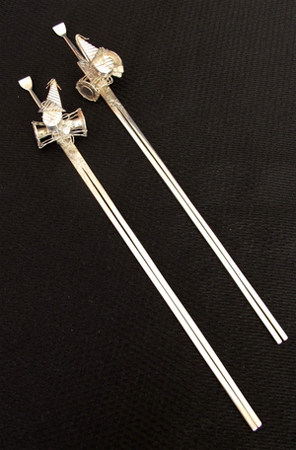 It was made by Treacher & Co, is in pristine condition and comes in its original box. Price: $2250. c. 1880. Also found on 1stdibs. The Riches of the French Empire by the Creative Museum, as well as these books, which can be found in our Resource Library.